VIOLET is a multi-award-winning musical based on the short story The Ugliest Pilgrim by Doris Betts. Music by Jeanine Tesori (Tony Award winner for Best Original Score with Lisa Kron for the musical Fun Home, and Tony-nominated scores for Caroline, Or Change, Shrek The Musical and Thoroughly Modern Millie), Book & Lyrics by Brian Crawley. 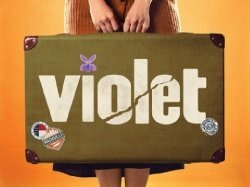 VIOLET premiered Off-Broadway and won the Drama Critics’ Circle Award and Lucille Lortel Award as Best Musical, before a Broadway revival where it was nominated for four Tony Awards. This is the UK premiere. Latecomers Policy: Due to the nature of the staging of Violet we cannot allow any latecomers and there is no readmittance once the performance has started.